Sunshine for Your Heart-sharing the hope and love found in Jesus: What are you looking for this Christmas? Tomorrow is Christmas Day! When I was a little girl, I loved Christmas and all the fun that surrounded it. I loved having the Christmas lights on our house that shined inside my window at night. I remember my Dad and I would go shopping and walk up and down the aisles of K-mart for over an hour and then leave only buying a box of chocolate covered cherries. 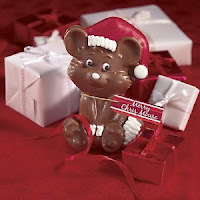 My Mom often sent me really special chocolates; my favorite being a chocolate mouse from Swiss Colony. I guess you can tell our family loves chocolate!! However, as I grew older and had our boys, Christmas began to be filled with more anxiety and stress. Decisions about who we would spend what day with, what would we buy the boys, how we could afford gifts, who all we should buy for, etc, seemed to cause more anxiety than peace. Not only stress, but often a feeling of let down or depression came almost the minute the last gift was opened. Was it because we didn't receive what we asked for? No, in fact, most always, we all received what we asked for. So, why did we feel so sad and often empty? During Christmas it often seems we are trying to find a "peace" or good feeling that we seldom experience any other time. We spend a year full of anxiety and chasing after many things. Suddenly, December rolls around and we turn our focus to Christmas. We put all our energy in getting the right gifts, having the great food that brings back memories of precious times, and spending time with family we haven't seen all year. Don't misunderstand me, all these things are great! However, when these things aren't grounded in and around Christ, we are always left empty. We expect Christmas Day, and all the activity that goes along with it, to fill the void we have in our hearts. Here is what the Lord is showing Chad and I: We can have Christmas all year long because we have Jesus all year long. HE is our love, peace, joy, patience, goodness, gentleness,kindness, goodness, faithfulness, and self-control. The fruits of the Spirit are just that; fruits of HIS Spirit. If HIS Holy Spirit is controlling our lives and we are walking with Him each day of the year, then we can truly have Christmas all year long. After the last gift is opened, He is still there. After we board our plane and come back home, He is still here. Who or what is our main focus? What do we want more than anything? The Lord has been asking me these tough questions. I have discovered that my peace is gone when the Lord is not the center of my everything. Again, Jesus is the answer. Letting the Lord fill the empty and hurting parts of your heart with Him is the ONLY way to have that peaceful and joyful Christmas we all dream about. As we prepare for Christmas Day tomorrow, I want to encourage you to read the following scripture and let it sink into your heart.